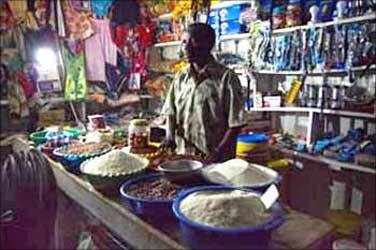 Rediff.com » Business » Say goodbye to kerosene lamps, here's Kiran! Say goodbye to kerosene lamps, here's Kiran! 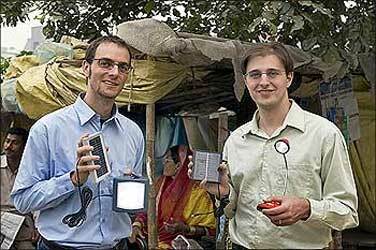 Their mission is to bring light to millions of households that do not have access to electricity. Betting big on solar lighting products, Sam Goldman and his team have embarked on an enduring journey to remove darkness from the remotest corners of the world. Sam was moved by an unfortunate incident, while working as a US Peace Corps volunteer in the West African nation of Benin between 2001 and 2005, which led him to focus on this segment. "My neighbour's son in Benin was badly burned by a kerosene lamp. It was disturbing to see that when we made so much progress in terms of technology, we still did not have a solution to this grave problem. So I had made up my mind to provide a source of light that is safe and cheap." He then joined Stanford University to pursue an MBA in social entrepreneurship. The idea got a fillip at the 'Entrepreneurial Design for Extreme Affordability' class at the Stanford University's Hasso Plattner Institute of Design. Sam Goldman then joined hands with classmate Ned Tozun to start D.Light Design, a company that makes affordable solar lighting solutions to serve the bottom-of-the-pyramid households in India and other markets across the globe. The initial research and early prototyping of what became D.light products, began in 2006. The company was officially founded in mid-2007 with the ambitious mission to reach out to about 1.6 billion people in the world without electricity, and another billion or more who have unreliable electricity. The company's latest product, Kiran (which means a ray of light), is a low-cost solar lighting solution, designed especially for households without access to electricity. Dubbed the 'kerosene killer', Kiran is priced at Rs 499 ($10) making it the most affordable, quality solar lantern in the world. The company's mission is to replace every kerosene lantern with clean, safe and bright light. "The Indian market is complex, competitive and difficult to tap. By 2010, we plans to serve 10 million people across the world," says Sam Goldman. A Silicon Valley venture, the company has received a funding of $6 million from both US and Indian investors, including Mahindra & Mahindra, Nexus India Capital, Acumen Fund, Garage Technology Ventures, Draper Fisher Jurvetson, and Gray Matters Capital. For Sam, India is an exciting place to be in, a land of infinite opportunities. No other country is as diverse, complex and as interesting as India, he says. 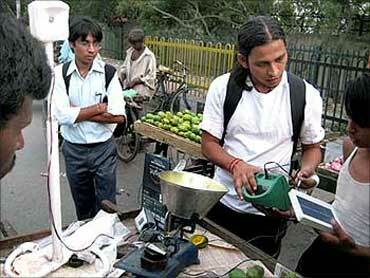 There are fantastic ideas among start-ups in India and in the social entrepreneurship sector as well, he adds. Sam Goldman, CEO and co-founder, D.Light, and Dorcas Cheng-Tozun, director (communications), share their views on how the company plans to transform the lives of people with simple and cheaper solar-powered gadgets. Image: Sam Goldman (left), with co-founder Ned Tozun. How is the experience of being a social entrepreneur? I was really lucky to find like-minded people to help me in this venture. Everyday we deal with brand new ideas and I learn new things. It is satisfying to hear that many people in the rural areas have hugely benefited by our products. We were fortunate as we sought funding prior to the current economic crisis. At that time, we found a significant number of venture capitalists who were very interested in investing in social enterprises. Investors were also attracted to the phenomenal social returns on such an investment, given that fairly straightforward solar lighting solutions can benefit families by increasing household income, reducing expenditures on kerosene, and improving education and health outcomes. In addition, the market potential is huge. Kerosene is currently a $38-billion-a-year industry. So investors clearly saw the great potential of D.light and were actually very enthusiastic about investing. I, along with Ned Tozun, participated in several business plan competitions and won $275,000 in prize money, which helped kick-start our funding. Image: Nova S200 (also known as Nova Mobile), with mobile phone charging feature. D.light is trying to do what no one has done before: to build a global consumer products company that is focussed exclusively on serving bottom-of-the-pyramid households. One of the most significant challenges for D.light is distribution. Our customers are naturally in some of the remotest areas of the world, many of which have never even seen electricity, let alone solar-powered products. Therefore, we need to be especially innovative in our marketing and distribution strategies in all our markets. We have rural marketing campaigns in, both, India and East Africa. We have also developed a thriving and fast-growing rural entrepreneurship programme in India, whereby individual people sell our products to their family, friends, and neighbours on a commission. This significantly increases our reach into the most rural areas and provides the important supplementary income for rural households. Are you looking at making products cheaper? The challenge is always to keep the price as low as possible to tap a large market. We continue to look at ways to make our products more affordable and accessible. We have done several pilot projects with microfinance institutions and have found this to be an extremely effective strategy to make our products more affordable. We haven't yet been able to do financing on a large scale, though, and we still want to develop products that are even more affordable. What was the reason for developing a product like Kiran? D.light has strategically chosen to first focus on solar lighting because we have found that bright, modern lighting has huge benefits. We have invested our resources in building out an entire product line of solar lanterns, offering products with different features and at different prices. The Kiran is our most affordable product yet, and was based on hundreds of hours of field research. We wanted to develop a low-cost product that still had the features that our customers most desired. Each feature of the Kiran -- its two light settings, the brightness, the colour, the shape, the handle -- were deliberate decisions based on customer feedback. Our desire in developing the Kiran was to make a 'kerosene killer', an affordable and high-quality replacement for kerosene lanterns. Could you tell us more about the making of Kiran? How many people were involved? How long did it take to develop it? It took several months for Kiran to move from concept to completion. Both our product design team (based in India at the time -- they have since moved to Hong Kong) and our product engineering team (based in China) were closely involved in the process to ensure that the product was well-designed, functional, and affordable. There were also scores of potential customers involved in providing feedback to us in every step of the product development process. 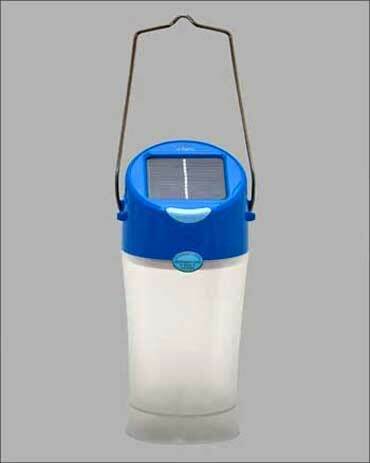 Image: Kiran: The cheapest solar lamp at Rs 499. How has the response to Kiran been? The response to Kiran has been incredibly strong in India and elsewhere. We find that customers really like the look of the product and are more willing to adopt this new product because of the lower price point. What kind of impact has Kiran created in countries like India? How has Kiran changed the lives of villagers in India? Like all of our products, the Kiran has had significant impact for our customers. We are focussing on Western and Northern India. 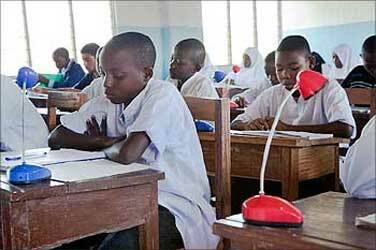 We have found that children are now able to study more effectively and for longer hours. They are able to increase their income through the extended workday. They are saving money because they no longer need to buy kerosene as Kiran is a bright, clean alternative to polluting kerosene lanterns. Our customers appreciate the light and portable Kiran which can be easily used in the field, at home, or while travelling. Besides helping the needy, it is very satisfying to see that people who are selling the products have been able to lead a better life. . . They tell me that this is a great product and it has helped them change their lives, helped them get a good income, helped them send their children to better schools. 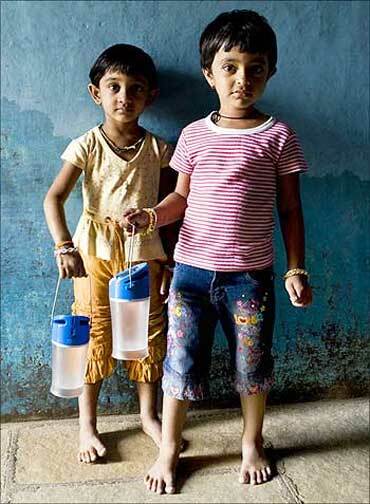 Image: Children holding the Kiran lamp in India. How is the market for low-cost solar lighting solutions? How is the market in India? 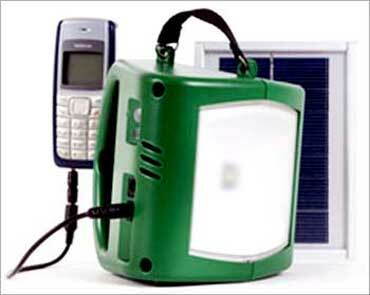 There is incredibly high demand for low-cost solar lighting solutions throughout the developing world. Most of our customers have not previously been exposed to high-quality lighting products, and so they are very receptive to our products. The greater challenge is ensuring that our products can reach these customers regardless of where they live. The market in India is also very promising, though it does tend to be more competitive than our markets in East Africa and elsewhere. There are already quite a few solar lighting products on the market in India, but we believe that our products offer the best value for the prices that our customers pay. Which are the other products on offer? The Nova Mobile provides high-quality light while doubling as a mobile phone charger. The Solata provides up to 15 hours of light on a full charge and uses highly efficient LEDs. It is 5 to 6 times brighter than a kerosene lantern, and performs exceptionally well for tasks where light is required from specific angles. How do you make these solutions cost-effective? How durable and user-friendly is this product? We know our customers very well, so we are able to design extremely useful, quality products without over designing. We understand what features are important to our customers. We work closely with our contract manufacturers and suppliers to ensure that we are getting the best prices possible for our components and manufacturing. Our operations in China ensure that we will be able to make our products at high volumes and low cost without compromising quality. All of our products are designed to be extremely durable. We understand that our customers live in rugged environments, in which there may be severe weather conditions (heat, typhoons, etc.) and dust. Our products are designed to last at least 1-5 years (depending on the product and the level of usage). We believe that all of our products are extremely easy and safe to operate (we find that children are some of the biggest users of the products), and that the little touches we've added, such as ergonomic, multiple-setting handles, make them highly functional for our customers. Image: Distribution in rural China. Which countries will you be targetting? Currently, our primary markets are India and the 13 countries within East Africa, with Tanzania being our main base of sales and marketing operations. D.light products are already being sold in nearly 30 countries around the world, in regions as varied as the Caribbean, Pacific Islands, South America, Southeast Asia, and West Africa. Is this a profitable business? The kerosene is a $38-billion-a-year-industry. So we certainly entered into this business expecting to be profitable. We expect to break even in the near future. Image: Nova lights up a shop in Tanzania. How important is innovation for a start-up to be successful? Innovation is essential in giving a start-up a competitive edge, and in keeping ahead of the curve. D.light is not the first company to develop portable solar lighting products, but we believe we are on the leading edge due to our creative product design process, distribution strategies, and business model. A part of innovation is also flexibility; when customers respond in a way you don't expect, or new market opportunities suddenly open up, it is imperative for a company to be able to adapt and capitalise on these opportunities. What is the future for innovative solutions like Kiran? We believe that there is room for tremendous growth in the solar lighting industry in general, and the bottom-of-the-pyramid space in general. We expect competitor products to continue come onto the market in the coming months and years, and so D.light will continue to push the envelope in terms of product development and distribution. Image: Nova used during harvesting in India. Photographs: Elaine Khoo / D.light Design. What are the five things entrepreneur must have to succeed? Entrepreneurs must have flexibility as everything is constantly changing. One must be committed and be tough as the path is often very difficult. They must be able to tell a compelling story. It is good to have mentors and advisors to guide you. One must be very passionate about the venture. 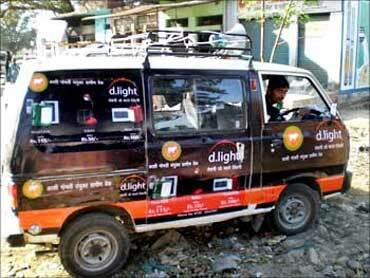 D.light wants to become the leading consumer products company for bottom-of-the-pyramid markets. Therefore, we will continue to develop innovative, high-quality, low-cost solutions that encompass light but also other important needs of our customers. We also plan to expand distribution significantly in all of our markets in the coming months and years. D.light's goal is to impact 10 million people by the end of 2010, and to reach 50 million by 2015. Image: Marketing van in India, which drives around to rural areas to market the products. The latest buzzwords? Solar products! How IBM is going 'desi'!